At The Bat Jungle in Monteverde, Costa Rica, tourists squint in the dark to see the tiny mammals darting through the air in search of fruit to gnaw on. The tour guide rattles off dozens of bat facts in a matter of minutes, including the importance bats have in seed dispersal. These nocturnal creatures have been historically depicted as evil forces, and humans pose the biggest threat to their survival. In reality bats are crucial components in ecosystems around the world. Monteverde is one of these places. There are 109 species of bats in Costa Rica and 60 of them live in the Monteverde area. The majority of bats are insectivorous (insect-eating), three species drink blood and one is carnivorous, said Richard LaVal, biologist and owner of The Bat Jungle in Monteverde. But misconceptions about these mammals led to mass slaughter of bats in Costa Rica less than 50 years ago. A wave of discontent originated from dairy farmers who were fed up with bats drinking their cows’ blood and eventually killing some of the cows. Thousands of bats were annihilated, but the majority of the bats killed were insectivorous, said Manolo Solis, a night tour guide in Monteverde. LaVal believes that ignorance about bats was the root of the problem in Costa Rica. “There have been really wholesale massacres of bats,” LaVal said. Bats have long been associated with vampires and other dark things, and superstitions about bats exacerbated the slaughtering. Solis is originally from a mining town in Costa Rica, and remembers trapping and killing bats in the mines as a child. However, as Solis grew older he learned about the benefits of bats and became intrigued with the flying mammals. A single bat can disperse 5,000 seeds per night, making them important to the pollination process. Bananas and agave are two of the most common fruits that bats pollinate in the Monteverde area, Solis said. In addition, about 70 percent of bats are insectivorous and help control insect populations. For instance, bats can eat hundreds of mosquitoes in a night, which amounts to two-thirds of their body weight, LaVal said. Monteverde’s perception of bats has also softened over the years as more research on them has been done and the word has spread, Solis said. Nevertheless, bats in Costa Rica are being threatened by humans once again. As the world’s population is growing and cities in Latin America are becoming more industrialized, the amount of light emitted from cities has increased. This amplification of light has reduced the amount of insects in places like San José, and consequently the number of insectivorous bats. “Cities all over the world have too much light,” LaVal said. 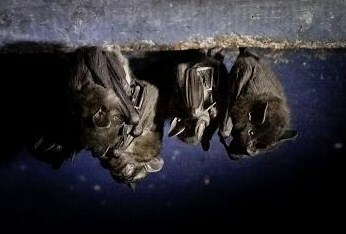 In San José, the diversity of species of bats has declined as the city has expanded, LaVal said. Pesticides can also hurt bat populations. LaVal visited bat caves in Missouri 35 years ago and discovered many dead babies. The caves were located near corn fields where pesticides were used, and after freezing the babies and running tests it was confirmed that pesticides in the mothers’ milk were toxic to their young. But people like LaVal and Solis are adamant about educating people about bats and helping the public understand their role in nature. The Bat Jungle was established five years ago and is managed by LaVal. The tours focus on biology, conservation and the latest discoveries in the field of bat research. Take the bat quiz to test your knowledge!